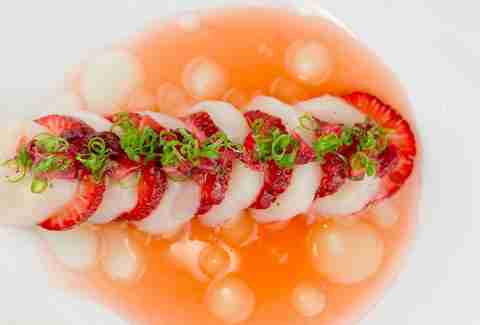 More than a sushi house, Sensi offers an Asian-fusion, fine-dining experience with steak and seafood found alongside sashimi and sushi rolls. All of the dishes are prepared with organic and naturally raised ingredients. The restaurant even has its own herb garden on the roof. 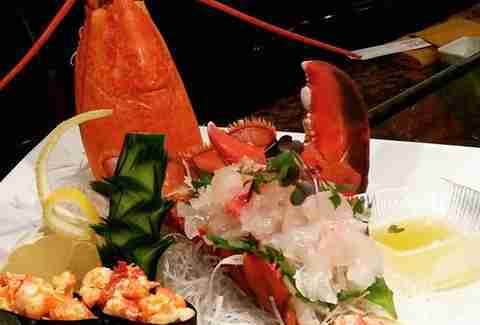 The sushi is among the most beautifully prepared and presented in Las Vegas, and the restaurant has the feel of a classic Japanese steakhouse. But if you really want to mix things up, order Blue Ribbon’s famous Asian twist on fried chicken, served with shichimi peppers and wasabi honey. 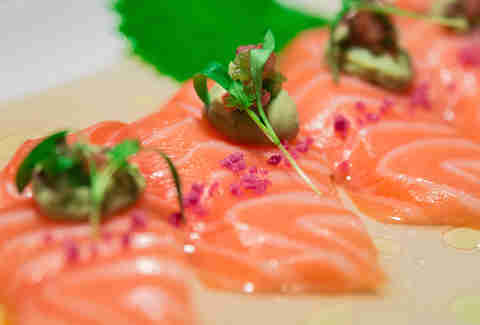 The intimate spot is one of the best reasons to visit Chinatown and showcases the craft of sushi as a work of art. Each individual piece is carefully prepared with attention to detail. Perfect for a date. Not so good if you want to show up with a bunch of friends and share some California rolls. There are a few places with the same name in Las Vegas, but the Yummy Grill & Sushi on Lake Mead Blvd is the one you MUST visit at least once. It’s independently operated by a chef who mixes up the menu daily with fresh fish selections flown in from all over the world, including Australia and Spain, as well as Japan. Pull up to the bar, ignore the menu and let him prepare a personalized experience that on any given night can include a whole Maine lobster, live scallops, or octopus tentacles so large they might have been found 20,000 Leagues Under the Sea. Kutsuya is well known in Hollywood for celebrity spotting, but the Las Vegas version offers a more subtle atmosphere with the same high quality Japanese cuisine. The menu is heavy on wagyu beef. 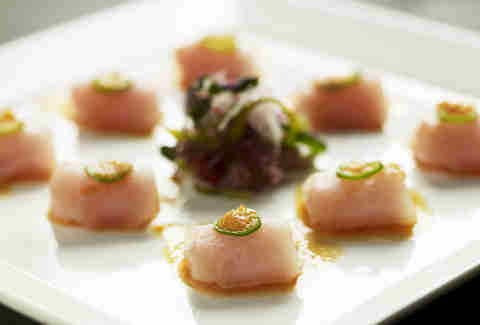 which balances out the lighter sushi plates like the yellowtail sashimi with jalapeño. 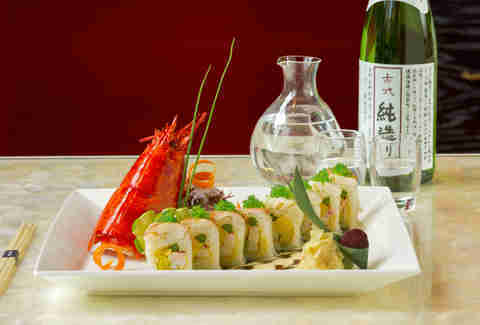 A complete Asian dining experience with Chinese noodles to go along with the sushi and other Japanese selections. Dragon Noodle is also known for handcrafted Tiki cocktails and an extensive wine list. The chef from Social House branched out on his own and now has a place in a Southwest strip mall that could almost be a mini-Chinatown. The idea is to expose locals to Strip quality cuisine without breaking the bank. The growing world-of-mouth sometimes leads to a short wait for tables, but it’s more than worth it for the 10-piece sashimi sampler or the eight-hour braised bone-in short rib with wasabi cream. 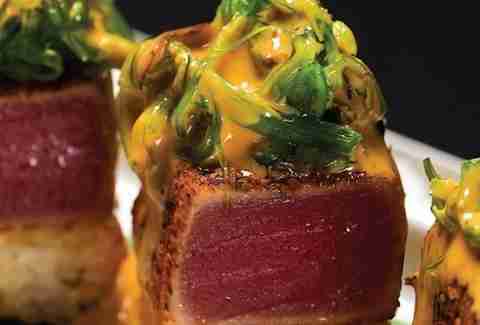 In a race to have the freshest seafood in Las Vegas, barMASA promises to only use fish selections that have been out of Japan’s coastal waters for no more than 24 hours. 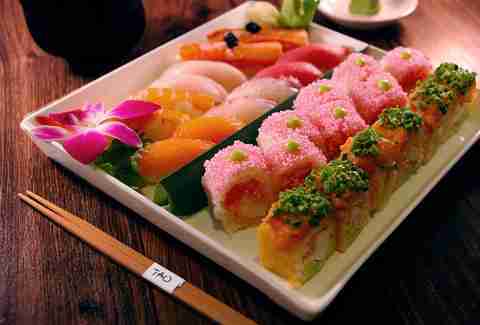 The signature roll is the Masa Toro Toro. 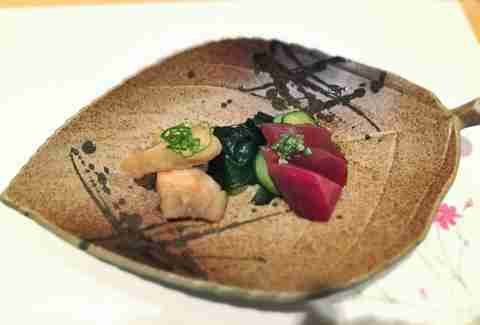 It’s filled with wild bluefin toro (which is a delicious fatty tuna), Tokyo Negi onions, and fresh wasabi. The scenery is almost as good as the food, thanks to a view that overlooks a Japanese garden, a koi pond, and 90ft-tall waterfall. Mizumi is also one of the few restaurants in the country that offer certified authentic Kobe beef. 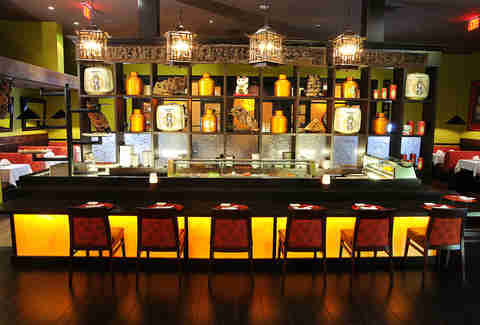 The dining room is very modern and offers a selection of Japanese cuisine served tapas-style. The sushi presentations are among the most creative you’ll find in Las Vegas and include the Fat Duck, made with crispy foie gras, eel, Gruyère, bacon, and avocado. 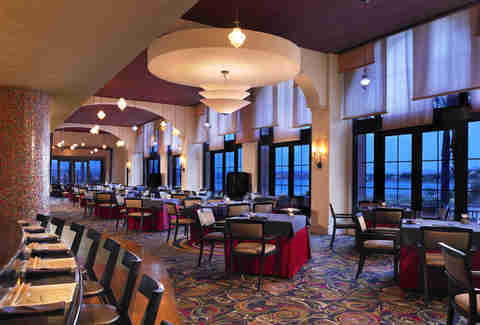 The restaurant fills the role of being the top dining destination at the Westin. 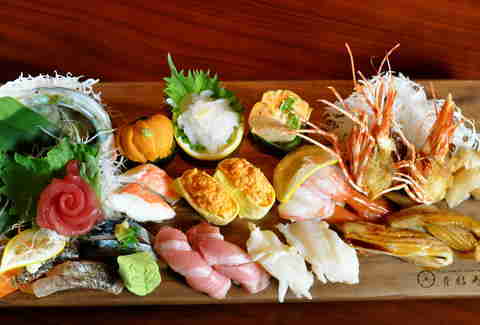 And while the name and menu have recently been expanded, the sushi remains the best reason to check it out. 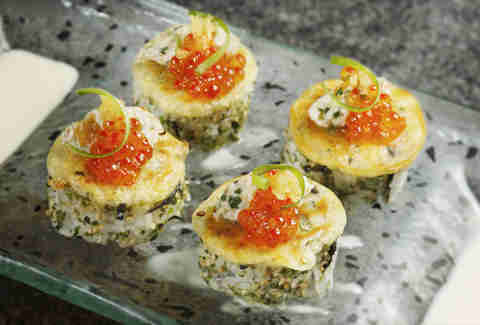 Enjoy a Crunchy Eel roll and then finish the night with a cocktail by the lakeside fire pits. TAO has a little something for everyone. 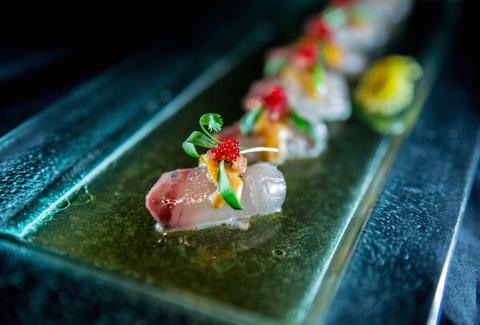 The Asian-bistro dining room is perfect for a date night, but you can also enjoy trays of sushi at the nightclub upstairs and by the pool at TAO Beach. The chef perfected his craft working at restaurants on the Strip and now has his own place in a location that used to be a New York-style diner. He’s on mission to keep hungry mouths away from all-you-can-eat sushi places while emphasizing the freshest fish from Japan. 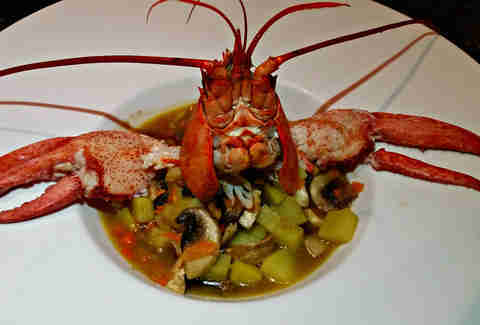 Don’t be surprise if you see a live lobster waving at you before dinner is served. 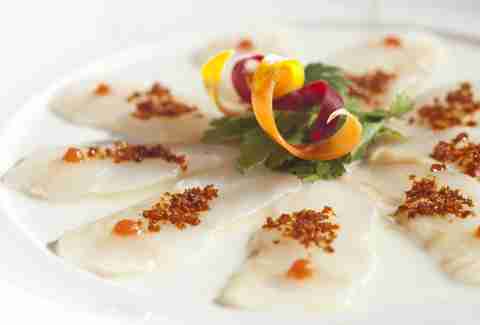 Nobu is more than just a restaurant. It’s also a hotel-within-a-hotel at Caesars Palace. But the buzz begins with the sushi and the snapper with dry miso. It’s the biggest Nobu restaurant in the world and the only one in the US to come with teppan tables for that Japanese steakhouse experience. The chef is former professional snowboarder who is clearly having more than a little fun putting a Korean-American twist on a Japanese menu. Check out the Pop Rockin’ sushi roll. It includes Pop Rocks sprinkled over spicy tuna, crab, salmon, and avocado.